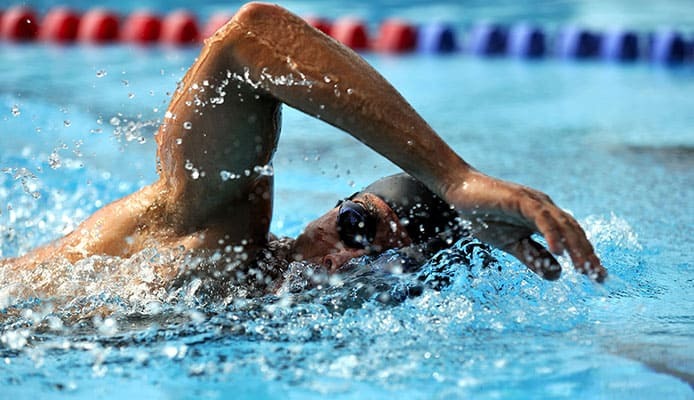 Swimming as a hobby and as your main choice of exercise is one of the most satisfying workouts to perform. There’s simply something primal and instantly impressive about a person who can master the water element and glide though it. Since you’re here, it probably means you’re really taking your swimming training seriously, and we congratulate you for it. A swimming parachute is indeed a crucial piece of gear for any swimmer who want to become stronger and to build more endurance. But, at the same time, it’s a type of training aid which is often misunderstood. To help clear the air and guide you on your way to becoming a better swimmer, we’ve put together this top of the best swim parachutes, as well as a few FAQs about them and the main specs to pay attention to. Out of all top rated water parachutes, this model is the best according to our standards. It’s pretty straight forward, and it has everything needed for any casual swimmer looking to become a pro. 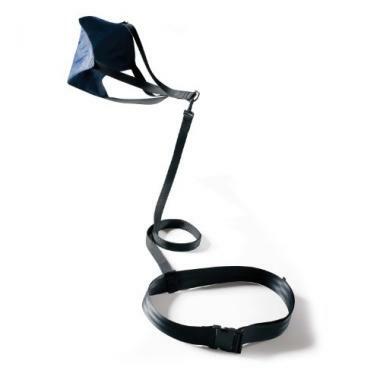 The drag parachute fasts securely on your body and it’s multifunctional: you can use it either with a chute, which is included, or with a bucket, which you’d need to buy separately. For starters though, the drag parachute is more than enough, and you should upgrade to a bucket only once you become stronger. The belt comes in 3 different sizes and will fit most swimmers. The resistance it provides in order to make your swimming experience more challenging. If you’re looking for the best swim parachutes model to include in a kit of swim essentials for beginners, this one is it. You could also safely put it on a list of the best gifts for swimmers, in case you’re lucky to share your passion with like-minded people. A reliable model, suitable for both adults and children, this is one of the best water parachutes you can find. The waist section is also strengthened with neoprene, which makes it more comfortable to wear compared to others. No more of those red rubbed patches after your parachutes training session! 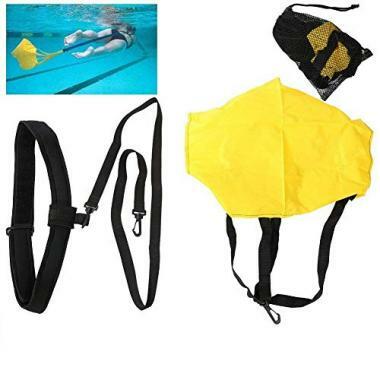 As far as safety is concerned, especially for kids and youth as well, this is one of the best swim parachutes you can find. It’s meant to fit all, and the bright yellow color makes the wearer easy to spot in case of an emergency. The size fits most and will adjust to all ages and body types. 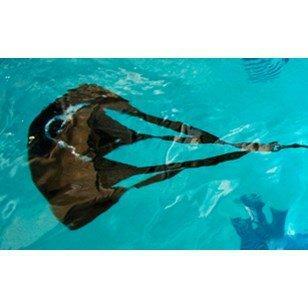 That’s what makes this swimming parachute suitable for adults and children, also. The length of the cord behind you is also generous (up to 3.9 feet) so you can adjust it to your needs and the size of the pool. The third option on our list of the best swim parachutes is this simple but reliable model from Finis. The brand is known for their affordable swimming gear, and this workout parachute is no exception. It comes in 2 sizes, each of them adjustable, so they will fit most people without any problems. The best part about it is that it also comes in 2 different resistance levels to choose from, too. Find the right fit for your current skill level and size and you’ll soon have one of the best swim parachutes at your disposal. It is also compatible with more advanced swimming techniques like kicking and flip turns. Usually swimmers needed to take off their workout parachute before engaging in such moves, but with this Finis model, you won’t have to. Still confused? Don’t worry, we have your back. Here are the main things to watch out for when shopping for the best swim parachutes. All training parachutes come in more than one size, but sometimes it’s hard to know what the size means, especially when it’s just a number of inches. You may think this number is meant for a particular measure of your body (shoulders or waist or whatever), since that’s how most wearables are coded, but no. It actually refers to the length of the cord, and the part which needs to be strapped to your waist will be adjustable anyway. The best swim parachutes are made from a combination of textile fabric and specialized plastic designed for sports use. Neoprene, isoprene and similar types of fabric are the most common. As long as you see one of these mentioned in the product description, you can be sure that your swimming parachute is going to be extra comfortable to wear, no matter for how long your training sessions stretch. The resistance provided by the best swim parachutes doesn’t vary that much, at least for as long as you keep the parachute attached to them. Usually, when swimmers want to take their training up a notch, what they do is remove the chute and replace it with a small plastic bucket. This implement will provide a higher degree of resistance than the chute. Q: What Is A Swim Parachute? A: A swimming parachute is a piece of gear designed to help improve your strength and endurance as a swimmer. There are many ways to train for swimming, including tips and tricks for how to increase your lung capacity for swimming. There’s also gear which helps, like swimming cords and many more. Out of all these, a reliable swimming parachute can help you get far in your performance. It can even help boost your muscle mass! As for the specifics, this is how it works: the workout parachute looks like a two-part piece of wearable. You have a belt strap which you need to securely attach to your body, and longer straps which drag behind you with the second part of the contraption. This second part of the swimming parachute is something meant to drag behind you in the water, causing you to exert more in order to move forward. Usually, it’s a special fabric small ‘parachute’, but sometimes it can also be a small bucket, for an even higher degree of in-water resistance. Q: Does A Swim Parachute Help You Swim Faster? A: Since a swimming parachute is essentially designed as a workout parachute to help strengthen your swimming muscles and boost your resistance, the answer to this is both yes and no. Yes, swimming training parachutes do end up helping you swim faster than you were able to before, but this is a long-term effect. After at least a few months of using one of the best water parachutes in weekly sessions, you may be able to start noticing an increase in your speed. At the same time, bear in mind that all training parachutes are designed to slow you down, making it harder for you to swim. So, while you’re strapped to a drag parachute your swimming speed will reduce, and you’ll find yourself straining more for every foot of distance you cover. This means that no, a swim parachute will not make you swim faster while it’s still attached to you. It will in fact slow you down for strengthening purposes, but it will cause you to become a naturally faster swimmer in the end. There are several ways to track your swimming workout; use any of them and you’ll soon notice the workout boost provided by parachutes training. We hope you now have a much clearer picture of what a swimming parachute is and how it can help you reach your performance goals. Hopefully, you’ve also managed to decide on which of the best swim parachutes suits your current needs best, and know what to look for in such a piece of gear. Enjoy your sessions, keep training and you’ll soon see amazing results. Happy swimming! Strength and Conditioning in Swimming, BritishSwimming.org. Have you ever used swim parachutes yourself? How long have you been training in swimming so far? Did an instructor recommend you to use parachutes training to perfect your technique or did you see it in professional swimmers first? Are you on your way to becoming a pro yourself? What’s your personal record using a swimming parachute? Share your thoughts with the rest of the Globo Surf community below!